This week’s “Numbers in the Real World” are numbers that count time. How many seconds does it take for a car traveling at 60 mph to stop? (6.87) . How many seconds does it take to fall in love? (8.2) . 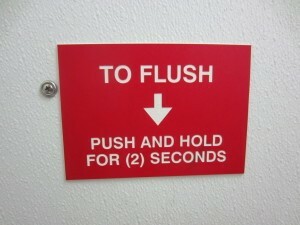 Well, at least one is supposed to take 2 seconds to flush this particular toilet. This toilet was on a boat. Thank goodness we have numbers to tell us how many seconds to hold the handle down. Flushing should not be left to guess work! 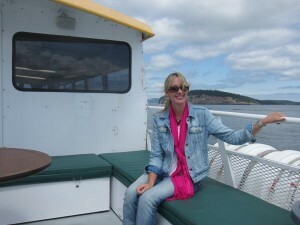 When I’m on a boat the last thing I want to be guessing about is how long to flush the toilet. Once again, numbers to the rescue! On boats, toilet-flushing instructions are just as important as life jackets! The 2-second rule in this case worked perfectly, and in no time at all (well some time — 2 seconds to be precise), I was out the bathroom door, and headed toward the stairs to the upper deck.